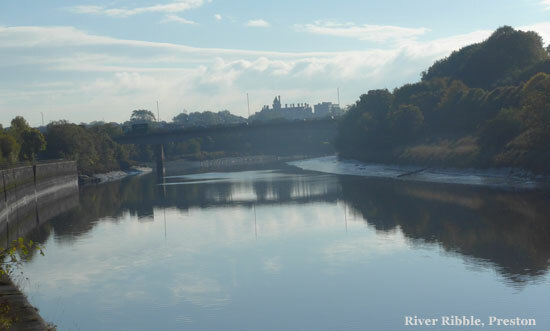 The River Ribble is gently picturesque. At about 50 miles from its source it lazily meanders around Preston forming the southern border of the city. It reaches Preston close to the M6 / A59 exit (junction 32) and leaves it in the west at Preston Docklands. The river passes most of England's types of scenery. Starting in moorland in the Pennines and Yorkshire Dales, its source appears indistinct among a collection of springs and becks rising out of the limestone above Ingleton. 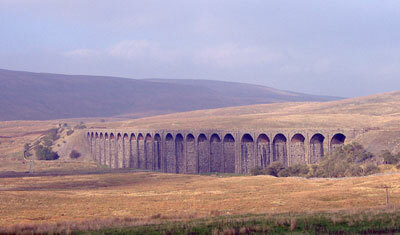 A long and well known railway viaduct, Ribblehead, gives it away and just beyond is the marker Spring, Ribble Head. The old railway station at Ribblehead is now a rail stop with a small museum and resident caretaker. How isolated this station is. We went on a winters day and there is nothing for miles except for the pub at the end of the viaduct, about 100 yards from the station. Looking over the viaduct, it gently curves, and just beyond is the long, dark tunnel. Bought a Ribblehead keyring in old BR style. The river flows south from here for about 15 miles and quickly builds up size with the becks and gills joining along the way. Past Horton in Ribblesdale, parallel to the Settle to Carlisle railway passing under it once and then a second time. At Stainforth the valley begins to widen and a few miles further it passes Settle and enters Lancashire. West of Long Preston it has begun meandering, slowing down for its ride through the more gentle country of the Forest of Bowland. At Hellifield it turns south west reaching Gisburn and Castle Haugh Ancient Monument (ringwork), Bolton in Bowland, Sawley, Chatburn, Clitheroe (castle), Pendle Hill. Continuing its south westerly direction it passes Stoneyhurst College and Ribchester before reaching the M6 and Preston. 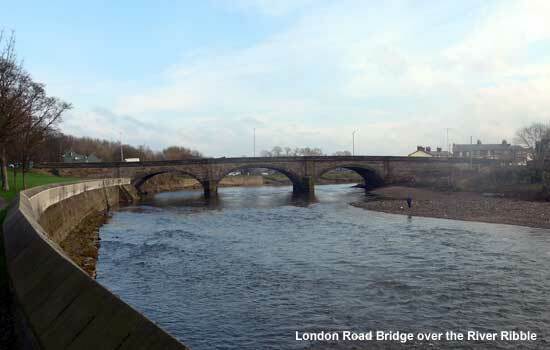 The river is reaching its tidal point, tides being between 20 and 30 feet in the Irish Sea, passing the Tickled Trout Hotel at the motorway junction, towards Cuerdale, Walton Le Dale then along the south border of Preston in a wide valley. 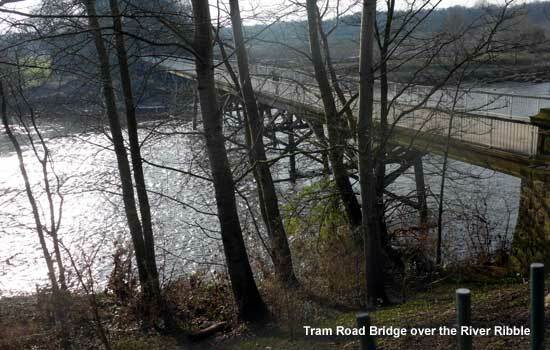 The river is now about 20 feet above sea level, after starting at almost exactly 1000 feet. Beyond Preston the river takes a new form with the estuary widening rapidly in a very flat, big sky, region between the Fylde and Lancashire Mossland. These areas are very agricultural with rich soils. 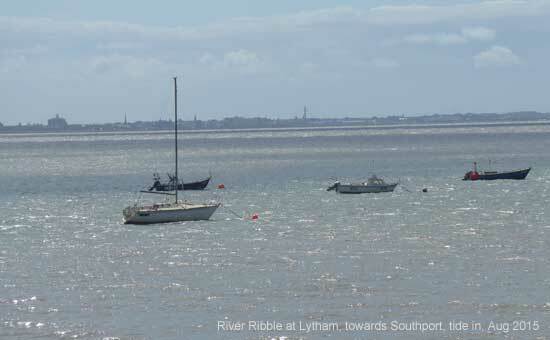 At Lytham St.Annes it is 5 miles across to Southport. 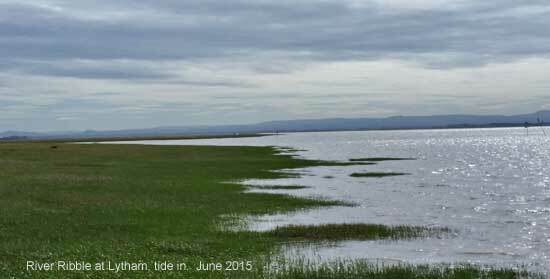 At high tide the estuary is full but at low tide there is often very little water. A dangerous area of sandbanks, marshlands, ideal for bird watchers. 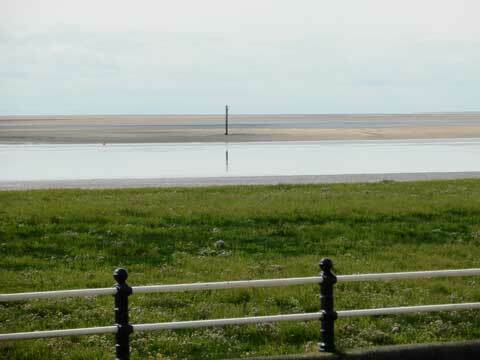 On the south bank of the estuary is the River Douglas which flows south towards Wigan and links with the Leeds-Liverpool Canal. More recently a spur to the Lancaster Canal has been built on the north bank enabling the two canals to be linked putting the Lancaster Canal onto the national network. In 2011 a significant wildlife reserve opened at Brockholes, next to the M6 / A59 junction on a gravel pit by the Lancashire Wildlife Trust. 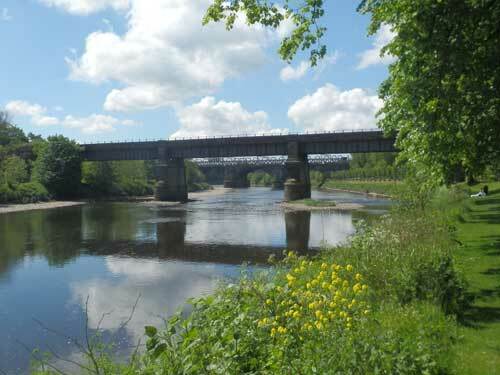 The far bridge is the West Coast Main Line crossing the River Ribble just before Preston Station. The bridge is the disused route to Yorkshire. 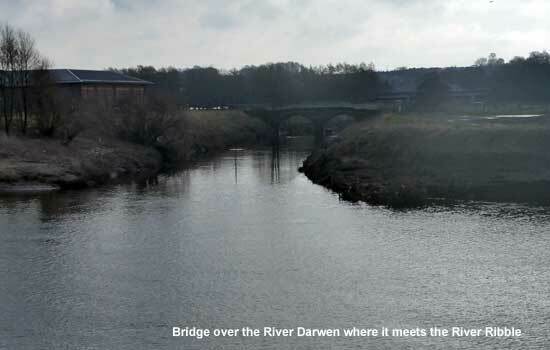 The A59 has a new bridge over the River Ribble at Preston. 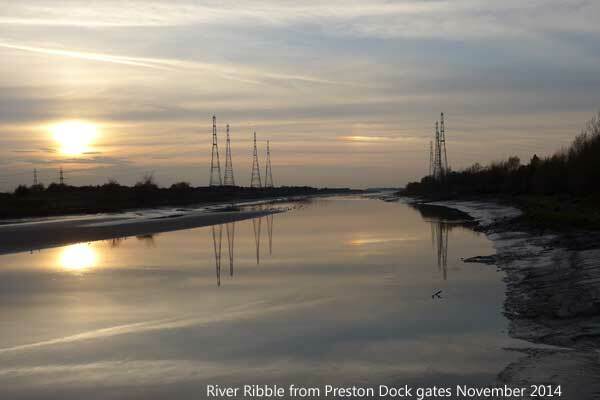 The River Ribble with the tide out as viewed from Preston Docks looking towards the sea.